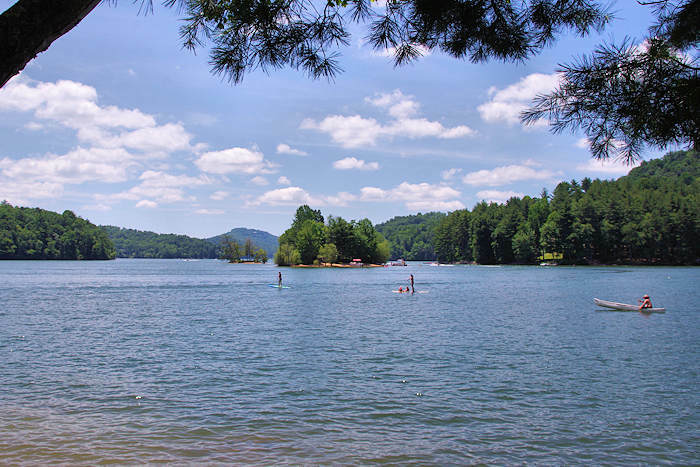 Just 6.5 miles from busy downtown Highlands is this hidden oasis that is definitely a secret to many. 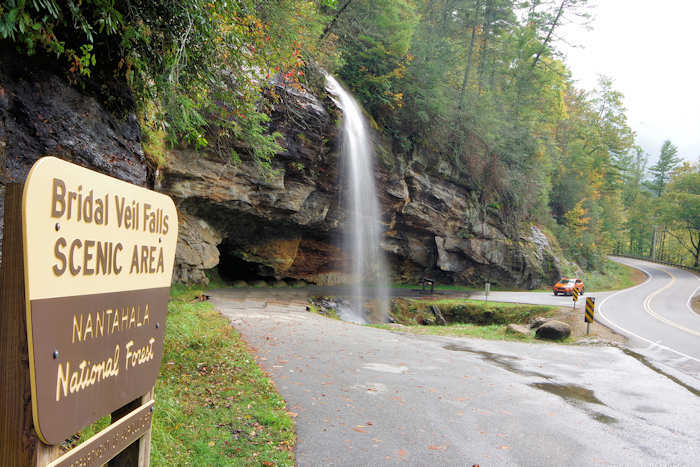 Secret Falls (also known as Big Shoals Falls) is a gorgeous 50-ft. waterfall on Big Creek that cascades into a serene pool, deep in the Nantahala National Forest near the Georgia state line. 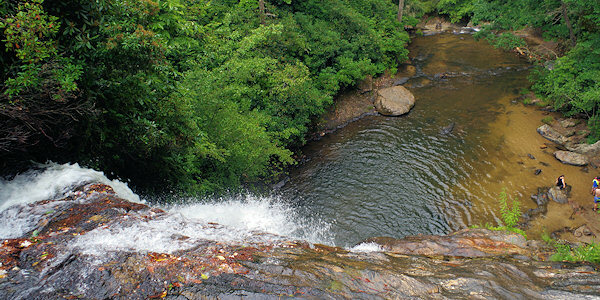 What an idyllic swimming hole on a hot summer's day! It's an easy half-mile hike, but there are no signs to the parking area. So, this remote area is mostly visited by locals. The trail is blazed with blue rectangles on trees and is easy to follow. There's one lone stake in the small parking area at the start of the trail that says "Secret Falls." 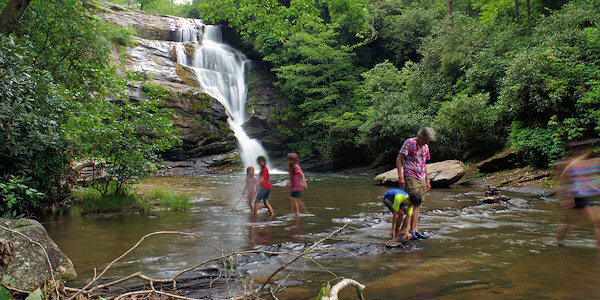 The wooded hike is easy enough for the entire family. 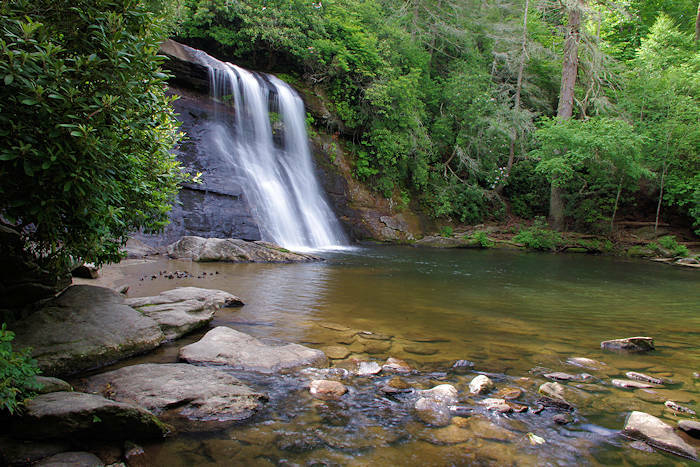 There are two easy creek crossings (one has a log bridge), a brief uphill section and a series of stairs after you reach the falls area. 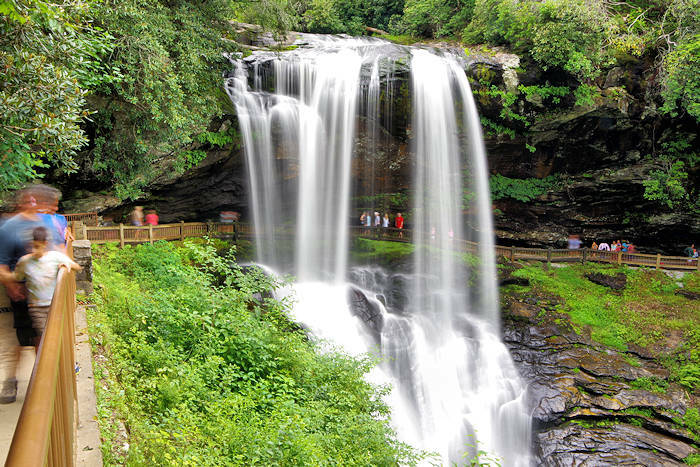 You'll approach the top of the falls area first, with a primitive campsite and side trail on the left to walk safely on the rock ledge at the top of the waterfall for a great view looking down toward the pool. Be sure to stay on dry rocks and stay away from the edge! It's probably a good idea not to take small children along the top of the waterfall unless you are carrying them. Continue down the main trail to a small, sandy beach with plenty of space for wading and taking photos. You'll have to climb over a fallen tree to reach the beach. The creek continues down another set of cascades, so keep the kids away from that area. From the main stop light in downtown Highlands (along US Highway 64), take Main Street, which turns into Horse Cove Road (toward the Nature Center). If you are driving east on US 64 (from Franklin), go straight at the light to stay on Main Street. If you are driving west on US 64 (from Cashiers), turn left onto Main Street. From the stop light, drive down the ridge on a very curvy paved road for 3.7 miles. Turn right onto Walking Stick Rd (SR1608), an unpaved one-lane road with two-way traffic! Watch for the occasional oncoming car, but this is not a busy road at all. Drive 2.5 miles to a fork in the road and veer right, crossing a bridge. Go another quarter of a mile and turn right on FR4567 (sign is hidden in trees). Drive another quarter of a mile to a small, dirt parking area on the left. Look for the stake that says "Secret Falls." Sometimes (especially winter), this last road is gated. But, you can park and walk the extra quarter-mile. 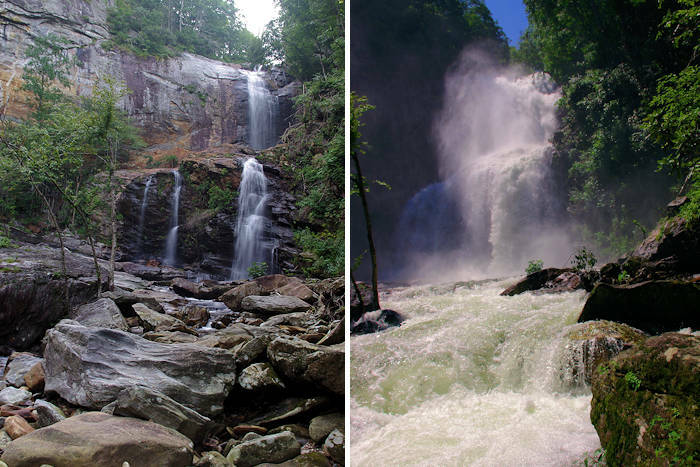 Other nearby waterfalls: See our favorite waterfalls in the Highlands and Cashiers area. 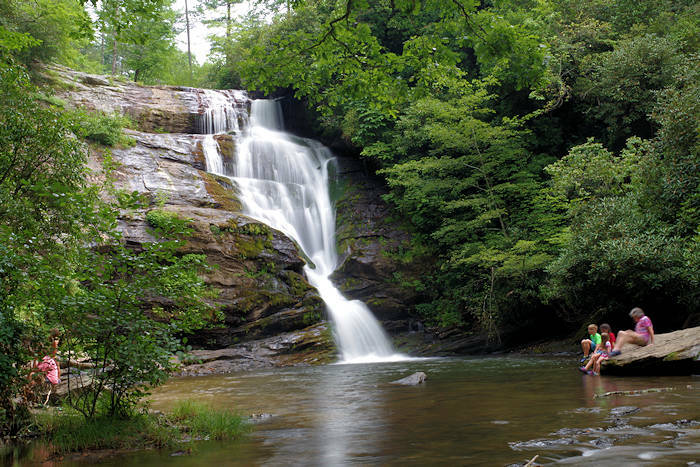 Another great waterfall hike near Highlands is Glen Falls.